John Terry has slowly and inexorably climbed the ladder of football success embodying the new Chelsea spirit as a one-club man (at least so far). Although slightly shorter than usual for a central defender and not particularly fast his positional sense, awareness of the game and sheer commitment have made up for it, to the point where he is now ever-present, and captain, for both Chelsea and England. Born in Barking, which makes him an Essex boy, not an East Ender as some sources claim, Terry shone in the Stepney-based boys club Senrab FC, who over the years have produced an unbelievable number of players for the top flight, including Terry’s current England team-mates Ledley King and Jermain Defoe. At the age of fourteen he was drafted into the Chelsea youth system, initially as a midfielder but later converting to a central defender. He made his début for the first team four years later, as a substitute, and made sporadic appearances over the next few years, not really establishing himself in the first team until 2000. He made such an impact that he was voted the player of the year for the 2000-01 season, and halfway through the following season was handed the Chelsea captaincy for the first time. When Marcel Desailly retired, the then Chelsea manager Claudio Ranieri handed Terry the captain’s armband and it’s been his ever since. His England career had started at Under-21 level where he made nine appearances and captained them on numerous occasions. Unfortunately a cloud fell over his transition to the senior squad when he was suspended from international duty, while investigations were made into an alleged incident at a nightclub, involving several other professional players. After he was cleared of all charges, the restriction was relaxed, but it had meant that he’d missed the 2002 World Cup. His full England début subsequently came as a sub in a friendly against Serbia and Montenegro in June 2003. 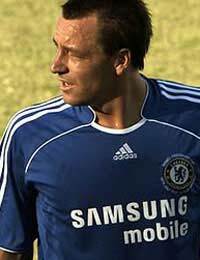 By the time the European Championships came round in 2004 Terry had been a key figure in England’s route to qualification and had established himself in Sven-Goran Eriksson’s mind as the first choice centre-back ahead of Sol Campbell and Rio Ferdinand. He had an excellent tournament in spite of England’s disappointing exit, on penalties at the hands of the hosts at the quarterfinal stage, and was named in UEFA’s all-star squad of the tournament. Terry had also established himself as a players favourite, being voted PFA Player of the Year for 2005 and getting his first taste of the England captain’s job after Michael Owen was subbed (the captain David Beckham wasn’t playing because of injury) in a World Cup qualifier against Poland in October 2005. The World Cup in Germany in 2006 was another disappointment, although Terry was once more selected in the all-star squad, the only English player in it. Against Trinidad and Tobago in the group stage he proved his worth, hooking the ball away from under the crossbar as Stern John tried to bundle in a free kick that Paul Robinson had missed. At that point, late in the first half, it was 0-0 but England went on after that to win 2-0. England then went on to lose to Portugal, again on penalties in the quarterfinal, and Terry was inconsolable, arguably the only one of the high-paid Premiership celebrities to have visibly given his all for his country. This passion was rewarded by Steve McClaren, who handed him the England captaincy after Beckham’s post-tournament retirement. Since then Terry has cemented his place as captain with a string of committed performances and the odd goal to boot. He scored his second England goal on his début as captain in a friendly against Greece and followed this up by scoring the first goal at the new Wembley Stadium in a friendly against Brazil, which England were unlucky to draw after a last-gasp equaliser. As the painful failed qualification bid for Euro 2008 unfolded Terry continued to be an ever-present force as captain, until injury forced him to miss the vital final games. England's failure saw Steve McClaren lose his position as England manager but incoming coach Fabio Capello has kept Terry on as captain and he will be looking forward to the World Cup in 2010. John Terry is already in on the top ten most capped post-war England captains and it's hard not to see him rising up that list. He is in his prime and is expected to put in many more performances as England's leader on the pitch.